Scene outside Wawa in the 2400 block of Tilton Road in Egg Harbor Township, New Jersey. 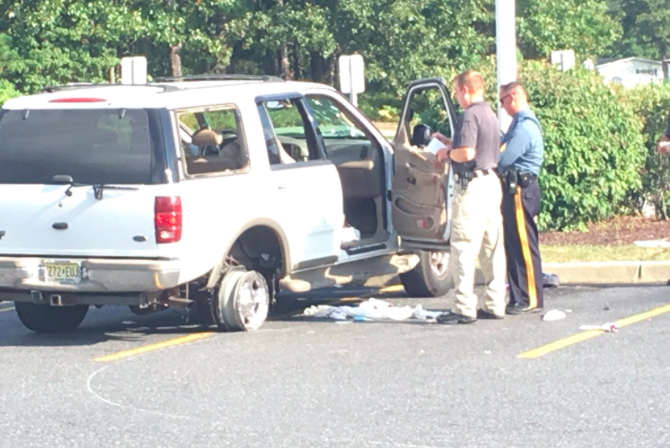 Update, Aug. 30, 3026: New Jersey State Police announced Tuesday morning that five people have been charged in connection with this shootout, which began on the Atlantic City Expressway and ended at the Wawa on Delilah Road in Egg Harbor Township. Read more about the shooting and arrests here. New Jersey State Police and authorities in Egg Harbor Township are investigating after five people were shot Monday afternoon — one of them fatally — in what has been a violent end to the month of August around the Atlantic County suburb. State police initially tweeted that there were at least two victims, but later clarified that there were five total victims and one fatality. Troopers out w/car on NB GSP Egg Harbor w/injured occupant. Unknown if related to any incident in Egg Harbor Twp. Ongoing invest. SP & Egg Harbor PD responded to shootings at 2 locations in EH area. 2 injured. 1 dead. Locations remain under invest. More info to follow. Victim update in shooting incident in Atlantic Co.: 5 total victims and 1 reported dead. NJSP and Egg Harbor Twp Pd. investigating. One of the shootings occurred around 3 p.m. near the Wawa store in the 2400 block of Tilton Road, according to multiple reports. The second shooting took place on the Garden State Parkway, state police tweeted. A spokesperson for Wawa told PhillyVoice that none of Monday's shootings occurred at the store. Several of the victims came to the Tilton Road location for help after the incidents. New Jersey State Police Captain Stephen Jones confirmed late Monday night that all of those involved in the shootings knew each other, according to Atlantic City-based freelancer Lynda Cohen. In an independent report, Cohen says the shooting is thought to have occurred around mile marker 11 or 12 eastbound on the Atlantic City Expressway. Jones said weapons and remnants of a rear tire were recovered in the area after one of the vehicles left the Expressway down Delilah Road. At approximately 3 p.m., a white truck appeared at the Wawa on the Airport Circle in Egg Harbor Township, according to Cohen. The injured driver, joined by two other shooting victims, requested assistance from a customer who then called 911. Separately, State Police were dispatched to mile marker 37.9 on the Garden State Parkway. There they found a 23-year-old Pleasantville man who later died from his injuries. His identity was not immediately revealed. Authorities found another wounded man at the scene. All of the victims were reportedly taken to the City Campus of Atlanticare Regional Medical Center. Officials said a third vehicle may have been involved, but it was too soon to release information. Monday's events come after a pair of shootings late last week in Egg Harbor Township, including one at a Wawa store on the White Horse Pike last Thursday night. A second shooting was reported Saturday afternoon in broad daylight on Washington Avenue, The Press of Atlantic City reported. Some residents told the newspaper over the weekend that the area has gradually become more dangerous and that too little information has been made available to the public. The conditions of the victims in last week's shootings were not immediately known. It remains unclear whether any or all of the shootings are connected. Egg Harbor City Mayor Lisa Jiampetti said the shootings remain under investigation. New Jersey State Police advised commuters to expect delays on the Atlantic City Expressway's eastbound lanes as authorities investigate the scene. Expect intermittent lane closures on ACXWAY Eastbound as NJSP investigates shooting in Atlantic Co. Expect delays. To begin soon. GSP both directions around exit 38 is backed up for couple miles because of the ongoing shooting investigation. Anyone with information about this incident is asked to call State Police at 609-882-2000.